Ananias was a wealthy man who had withheld some of the proceeds from the sale of his properties, (the Apostles had been on a mission to persuade people of great wealth to distribute the sale of lands and property to the poor). Peter publicly rebukes Ananias who falls down dying in full view of the assembled crowd of onlookers while on the left of the cartoon the Apostles give alms to the needy. On the far right of the painting Ananias' wife Sapphira, (depicted in a green gown), counts coins, a product of her own embezzlement, is oblivious to her husband's fate. Three hours later she too is struck down dead. The wider message is clear, do not steal from Church funds. 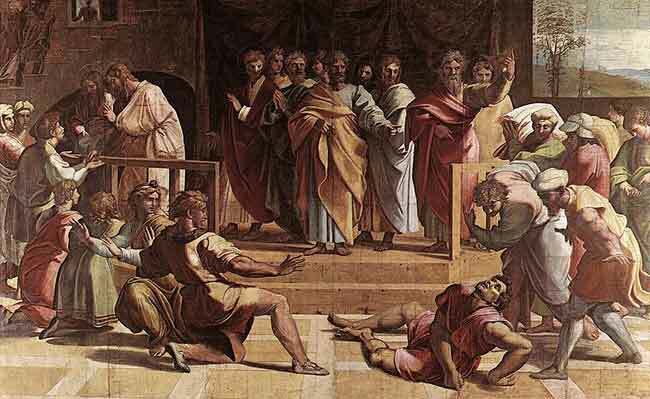 The figure of Ananias is probably by Raphael but several of the other characters have been completed by members of his workshop, notably the recoiling man has been attributed to Raphael's assistant Giulio Romano. 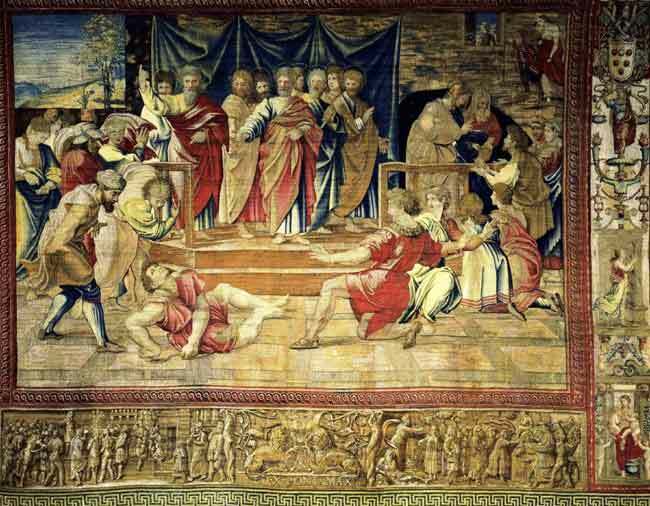 This is one of the tapestries that was not delivered in time for Display in the Sistine Chapel on 26th December 1519.